Don’t miss a statue of a golden-horned chamois. There are many versions of the tale. I love the one where the furious animal gored his way down from the mountain, tearing up the ground and leaving gaping holes that later filled up with water to form the Triglav Lakes valley (read more) or the tragic love story where a hunter fell in love with the beautiful innkeeper’s daughter (read more) . 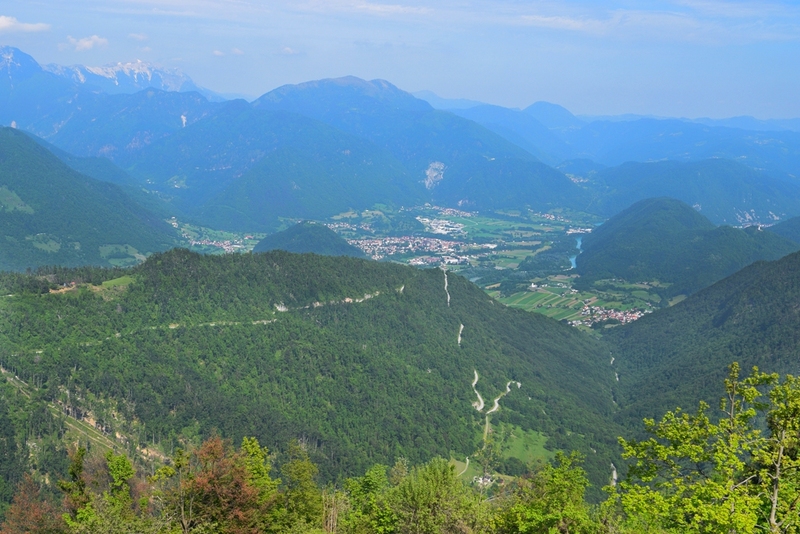 Then follow the road to the Vršič pass, which will lead you through the Julian Alps. It’s the highest road in Slovenia and has 50 hairpin bends (fun fact: they are all cobbled). The road was built during World War I by Russian prisoners of war. 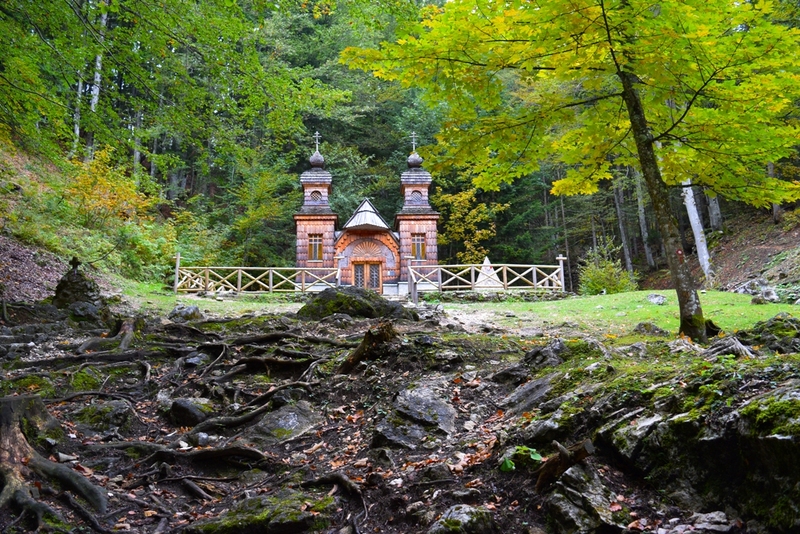 The survivals of the work camp built a small wooden memorial chapel in 1916. Up to this day, Russian chapel can still be visited. It was last renovated in 2010. 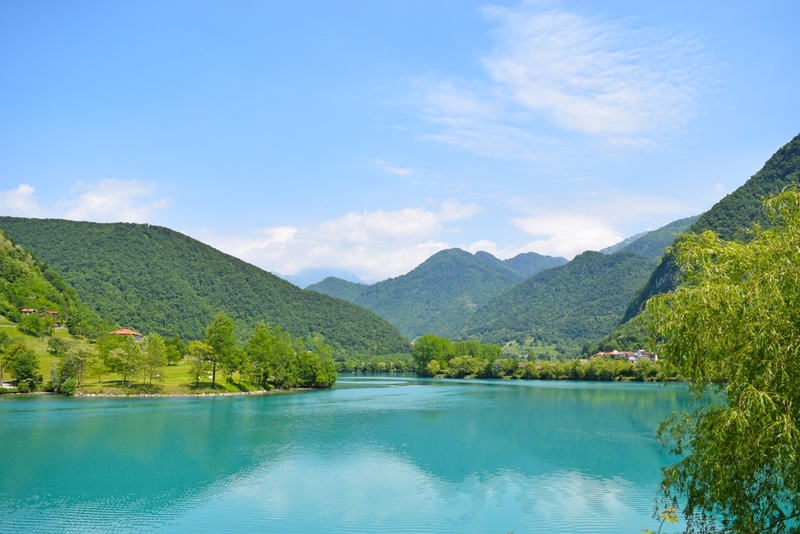 The next sight on the list is the source of Soča river. A marked path starts ascending behind the mountain hut. 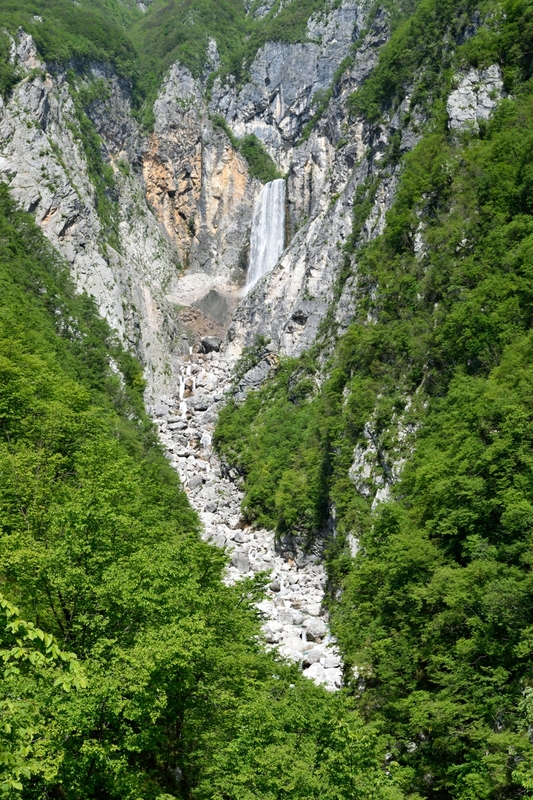 A 10-minute hike will first take you to the 10-meter waterfall, located just below the source of Soča. Getting to the waterfall is simple, but not everyone will continue to the river-bed. I’d certainly advise not to do it in a bad weather. 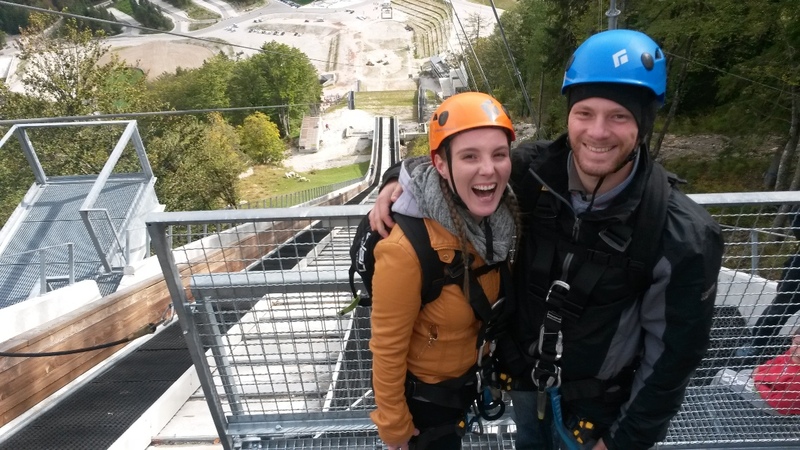 To get there you have to cross an exposed steep slope, secured with steel cables. That’s additional 3 minutes of walking. As scary as it looks, I can tell you first hand (note I’m VERY clumsy) it’s perfectly safe and not as difficult. Even the kids have no trouble BUT please wear the appropriate footwear. When we were there, we decided to leave the car on a parking space (it’s free) for a while longer and go walk around a bit. We just followed the main road and caught some gorgeous views that way. 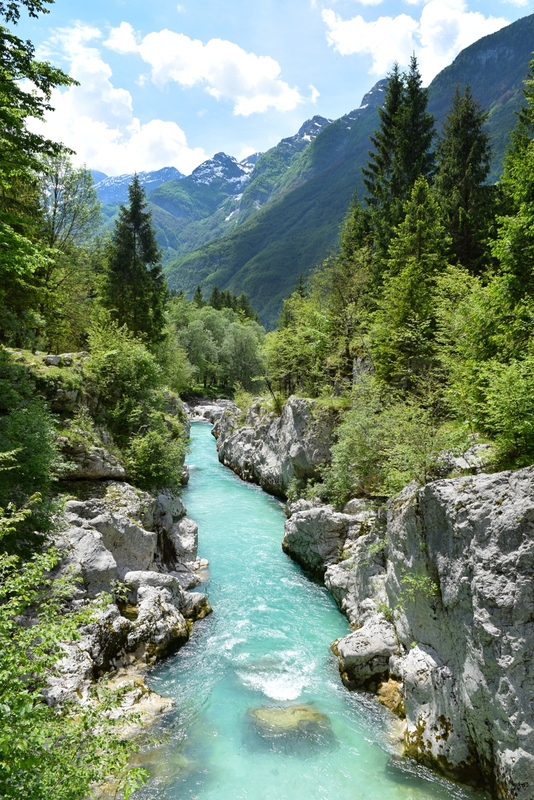 Then drive to Great Soča Gorge, a natural sight you mustn’t miss. 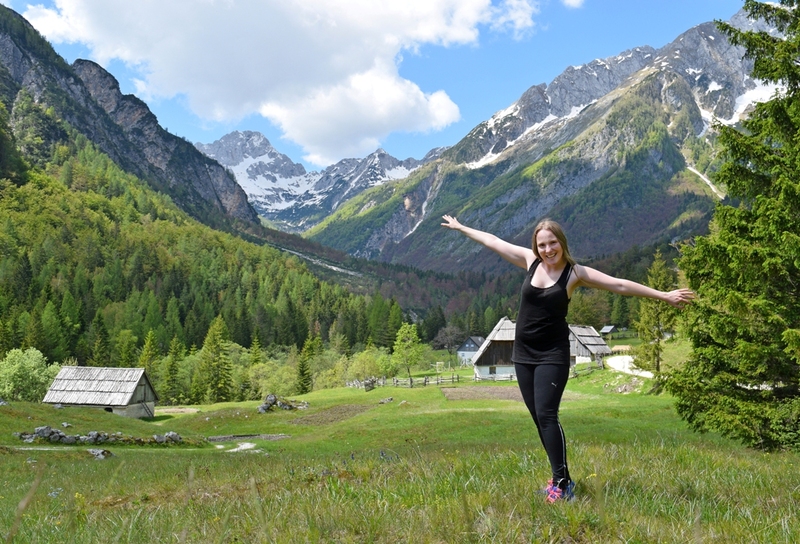 To get there, follow the signs for Lepena Valley behind village named Soča. Great Soča Gorge is a perfect spot for some kayaking. Take some time to relax, eat your pre-packed lunch and observe the beauty around you. If you decide to go kayaking or rafting, this is all for your first day. 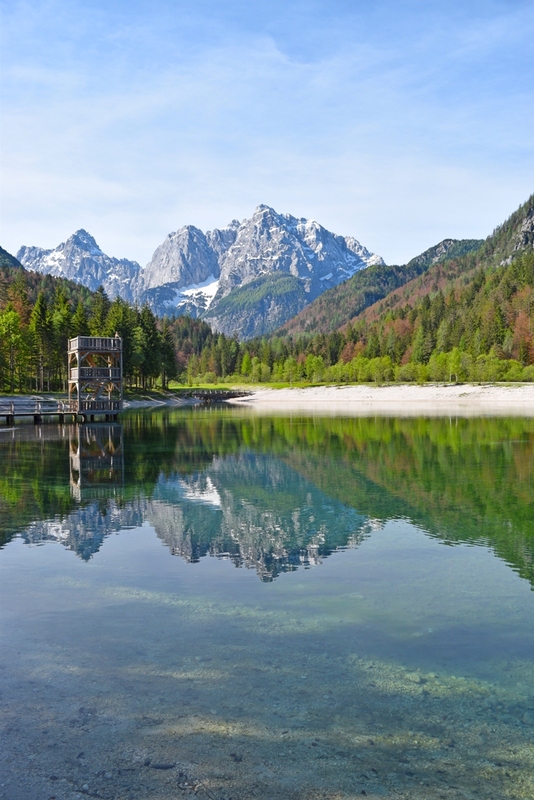 Although it seems like a lot, you must remember Slovenia is tiny and most attractions mentioned above are around 10-minute drive apart, so you can take it easy. In case you’re on the budget or just prefer hiking (like I do), I have one more recommendation for you. Continue driving for another few minutes on the same road that you ended on when visiting Great Soča Gorge. You may see the signs for Kamp Klin (Camp Klin). Keep driving a bit further from there. Park where you see a bridge and a wooden sign saying “Šunikov vodni gaj 1km”. It looks like this. Start walking towards Šunikov vodni gaj (Šunik water grove). You’ll know you’re there when you’ll feel like you stepped into a fairy tale. The 100m gorge with beautiful green pools is gorgeous and not well-known by tourists. The walk is around 20-minutes long and well-marked. I suggest you book a room in Bovec area. TIP: Wear hiking or sports shoes. The paths you’ll walk are very stony and it’s dangerous to get there in sandals. I hiked in my Nike’s and when we reached the destination, I put the shoes down and let my feet relax. 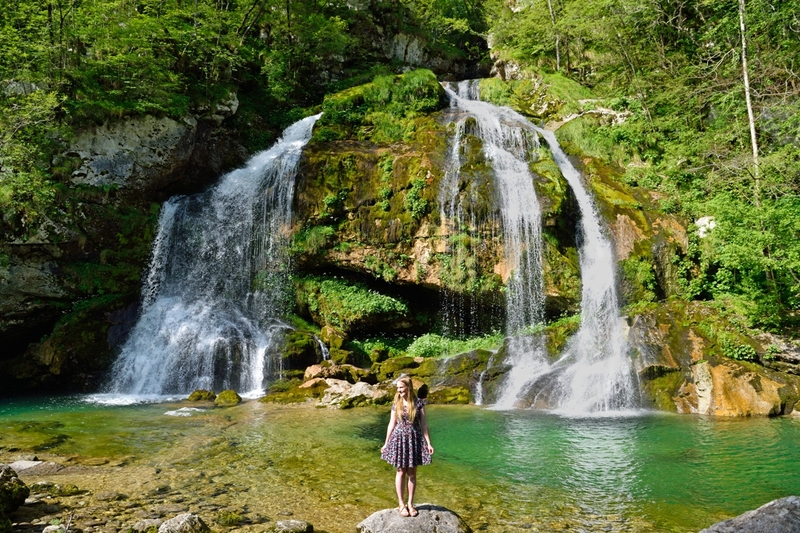 Your first stop for the day is one of the most beautiful waterfalls in Slovenia: Virje waterfall. It’s located in the village of Plužna. Unlike Kozjak, this one is not incredibly well-known and not flooded with visitors either. There were two other ladies enjoying the view when we got there, but soon we had the waterfall all to ourselves. It’s perfect for taking a refreshing dip on a hot day. Depending on where you stay, it may be smarter to go there by foot because there are no parking spots available. We left the car by a very narrow road, but I wish someone would have told us to park further and walk a bit. Slotrips suggests you ask around where to park. After that, I suggest you go to Boka waterfall viewpoint to see one of most fluid waterfalls in Slovenia from a distance. There are many signposts along the road, so you’ll hardly miss it but basically if you just drive from Bovec to Kobarid, there is a sharp bend to the right after around 4 kilometres. That’s just before the bridge over the Boka river and we found it by just following the signs. The parking place is at the left side of the road. You’ll have to walk for around 10 minutes, crossing a stony forest. 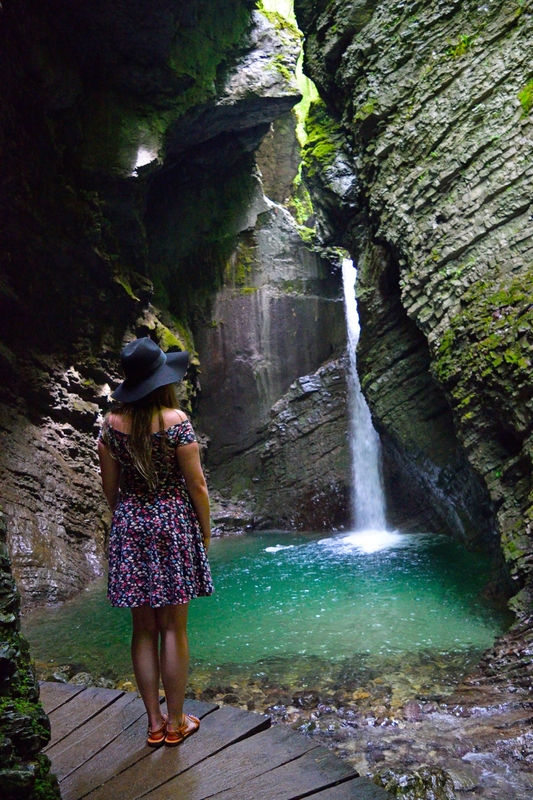 The last Slovenian waterfall you’re visiting is Kozjak waterfall. You might be able to recognise it from Instagram. It’s a very romantic spot, however one of the major attractions in Slovenia, therefore always busy. When you’re paying for the parking spot, make sure to pay for two hours or more. The trail will take you around half an hour each way and once you reach the waterfall, you certainly don’t want to be in hurry to get right back to your car, because believe me, it’s gorgeous. For lunch I recommend crepes at Kamp Lazar (Trnovo ob Soči 1b, 5222 Kobarid) – I chose cheese pancakes (crepes) with meat filling (from €8) and they were fantastic! The portions are very generous. Also, there are plenty other choices too (my boyfriend had risotto and he loved it). The second part of the day will be focused on history lessons. 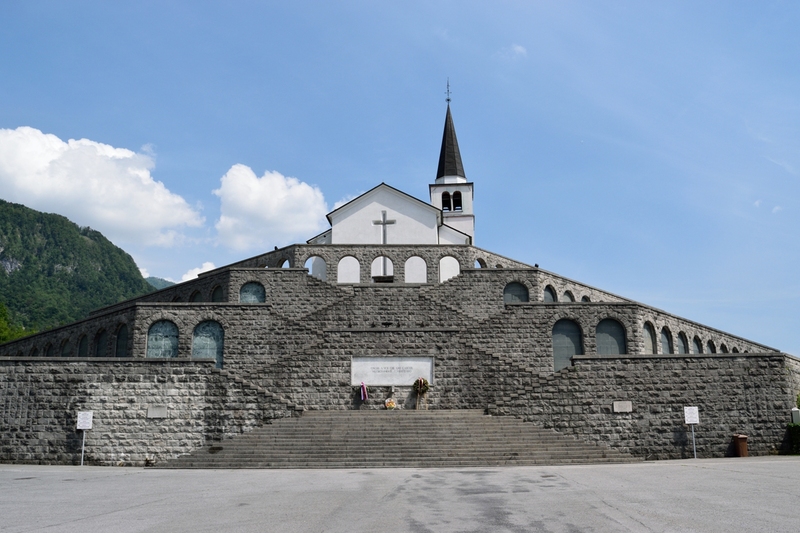 The Kobarid museum (Gregorčičeva ulica 10, 5222 Kobarid) is one of the best ones out there. The entrance is affordable (€6 for adults, €4 for students – full price list here) and the museum is incredibly informative on World War I. Because of its location, Kobarid was the scene of numerous invasions and wars. The turbulent history shaped the city into what it is today. The museum has collected several awards since its opening. Just a minute away, there’s a large Italian ossuary with the church of St. Anthony. Memorial and a resting place for 7000 Italian soldiers, who died in WW I. It also makes a nice viewpoint. Another great spot for nice panoramic vies is Kolovrat. 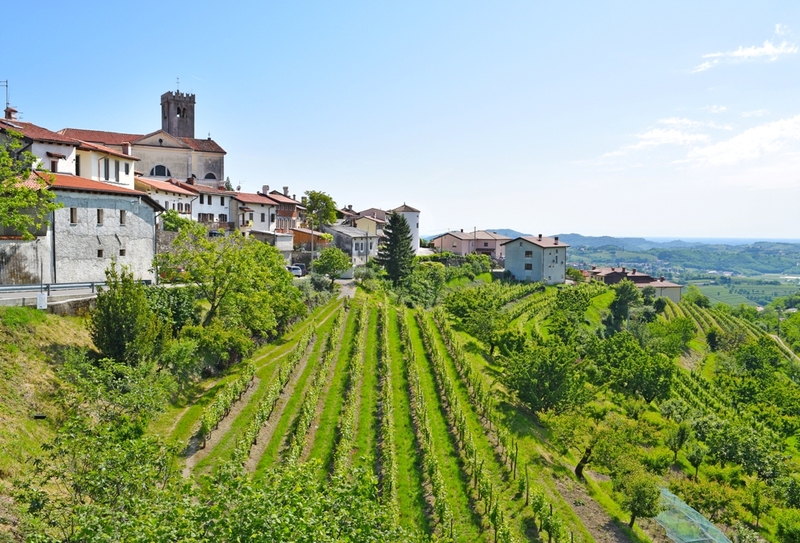 The outdoor museum is located between the Upper Soča Region in Slovenia and the Veneto Region in Italy. In WW I the Italian army built here an extensive system of its third line of defence, called “linea d’armata”. It takes quite a while to get there, but it’s a must visit (I’m very grateful my friend recommended it when I was planning the road trip). I suggest you book a room in either Kobarid or Tolmin. 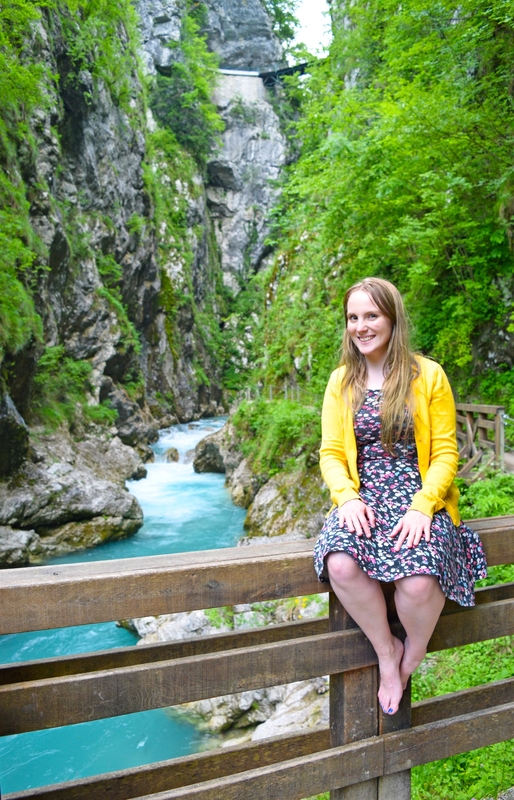 You’ll start with a stroll through Tolmin Gorges, the lowest point of Triglav National Park. Be prepared for many great photo opportunities! Entrance fee of €4 (adults; €3 students, €2 children) needs to be paid at the small hut. Once done, drive to Most na Soči, where you can even do a boat tour if you desire. We didn’t, instead we walked a bit around the lake (we did not go all the way around). After that, we visited an incredibly charming little town, Kanal. It was a mandatory stop because someone (coughs) was craving a gelato. For lunch I recommend finding a restaurant in Goriška Brda. Klinec is a family-run restaurant well-known for traditional food and wine from their own cellar. We stocked up on fresh cherries and started exploring. Very picturesque Šmartno was first on the list, followed by the unplanned climb to 23m high lookout tower with 144 stairs – the view tower in Gonjače. On a nice day, you can see the Julian and Carnian Alps, as well as the Dolomites to the North, the Friulian plain to the West, the Trieste Gulf and the Karst to the South, and the Trnovo forest and the Vipava Valley to the east. Impressive, isn’t it? There’s much more you can do in Goriška Brda. Wine-tasting is an amazing idea, for example. Who doesn’t love a glass of a high-quality wine? Although that’s a 3-day guide, you could easily extend it to 5 days or even more. 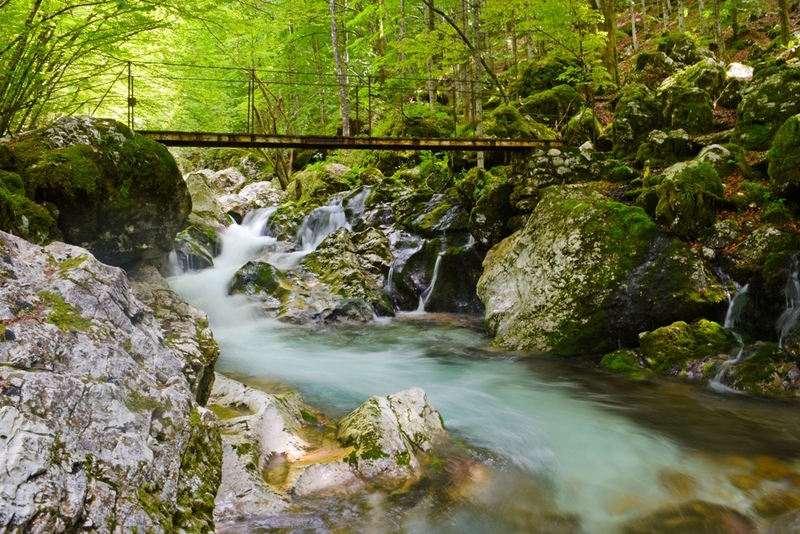 Slovenia’s full of hiking trails, breath-taking waterfalls you can take a dip in and adrenaline sports. No matter for how long you come, it won’t seem to be long enough to experience everything, but with this guide, you can get very close to seeing the best of what Slovenia offers.